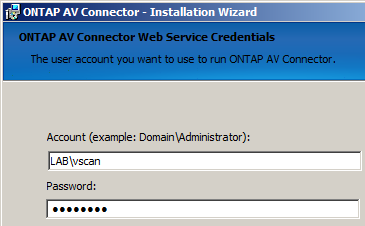 Just one domain user account, which is an administrative user on both VSCAN servers. Log on using the Anti-Virus administrator user account (in this case LAB\vscan). We already have a CIFS server setup on the domain (lab.priv) for our Vserver NASVM1. In the following example, our Vserver NASVM1 only has data LIFs (we’ve not configured a management LIF in NASVM1). We don’t want to configure a management LIF in NASVM1; we simply want to use the Cluster Management LIF. Enter a DNS name or IP Address for the Cluster Management LIF (NACLU1). Enter the VSCAN domain user account (LAB\vscan) and it’s password. And if all is good you should get “ONTAP to ... using account ... was successful” - click OK. 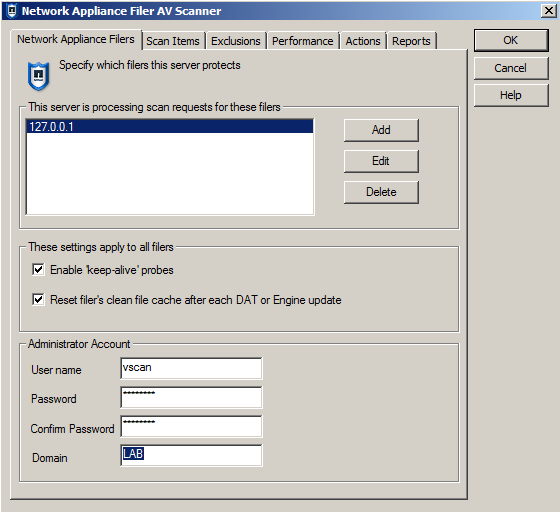 In the VirusScan Console: Network Appliance Filer AV Scanner and Network Appliance Filers tab, under ‘Administrator Account’ we add our VSCAN domain user account. IMPORTANT: Also notice in the image below that the loopback IP 127.0.0.1 has been added under ‘This server is processing scan requests for these filers. NACLU1::> vserver vscan scanner-pool apply-policy -vserver NASVM1 -scanner-pool POOL1 -scanner-policy ? NACLU1::> cifs share modify -vscan-fileop-profile ? no-scan - Virus scans are never triggered for accesses to this share. standard - Virus scans can be triggered by open, close, and rename operations. strict - Virus scans can be triggered by open, read, close, and rename operations. writes-only - Virus scans can be triggered only when a file that has been modified is closed. When creating the login for the scan user account ( security login create -username LAB\vscan -application ontapi -authmethod domain -role readonly -vserver NACLU1 ) I get an error - Error: command failed: failed to set field "role" to "readonly"
Why can I not use the readonly role? What is the cause? Sorry Paul, I don't have the answer. Does that account you're using have permission? What's the version of ONTAP? You should use your cluster mgmt lif which will then see all of the SVM. Then setup that user without defining a vserver. 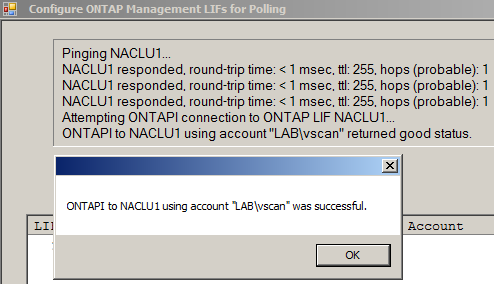 I got a problem, when I try to set the Ontap Management LIFs on step 3, I always get ".. failed. The underlying connection was closed."